There was once a Padishah who had forty sons, and they spent the whole day in the forest, hunting and snaring birds. When the youngest had completed his fourteenth year their father thought it was time they were getting married, so he called them together and spoke to them about the matter, “We are willing to marry,” said the forty brothers, “but only if we can meet with forty sisters all having the same father and mother.” The Padishah therefore sought throughout his dominions for such a family, but in vain: the greatest number of sisters in all the land was thirty-nine. “The fortieth will have to take another,” said the Padishah to his sons. But they refused to agree to that, and begged their father to allow them to travel in foreign countries to seek the desired brides. What was the Padishah to do? As he could not dissuade them, he grudgingly granted their request. Before they set out, however, the Padishah said to them: “There are three things which you must bear well in mind. When you reach a large spring, do not spend the night anywhere near it. Farther on is a hân; do not spend the night there, either. Beyond the hân is a great plain; do not linger there a moment.” The sons, promising to remember their father’s advice, mounted their steeds and rode away. Smoking and talking, they wended their forward course, and as evening drew on they came to the spring. So they alighted, ate their supper, and lay down to rest. The youngest, the fourteen-year-old brother, kept watch, however. Towards midnight he heard a rustling sound. Cautiously he drew his weapon, and as the sound came nearer he saw a seven-headed dragon. Both beast and youth rushed to attack one another. Three times the dragon wrestled with the youth, but could obtain no advantage over him. “Now it is my turn,” cried the Prince, and with these words he struck the dragon such a powerful blow that six heads fell from his body. “Strike once more,” gasped the dragon. “Not I,” returned the youth. The dragon sank to the earth, and behold! one of his heads began to roll, and it rolled and rolled till it reached a well. “Let him who has taken my life, take also my treasure,” said the head as it fell down the well. The youth now took a rope, bound one end to a rock, and with it let himself down the well. At the bottom he found an iron gate. Opening it and entering, he saw a palace even more beautiful than that of his father. In the palace were forty apartments, and in each apartment sat a maiden at an embroidery table, near which immense treasures were piled up. “Are you a man or a jin?” asked the terror-stricken maidens. “I am a human being,” answered the Prince. “I killed the seven-headed dragon and came to this place by following one of his rolling heads.” Now the forty maidens rejoiced. They all embraced him and begged him to remain with them. Incidentally they informed him that they were forty sisters whom the dragon had stolen. He had killed their parents, and now they had not a single friend or relation in the wide world. “We are forty brothers,” said the Prince, “and seek forty maidens.” Then he told them he must ascend to his brothers, but that soon he would come again to fetch them away. He came up from the well and went to the spring, where he lay down and fell asleep. Early next morning when the forty brothers awoke, they began to laugh at their father’s attempt to frighten them about the spring. They set off again and continued their way until evening, when behold! the hân their father had mentioned stood before them. “We go no farther tonight ” said the elder Princes. The youngest, however, expressed the opinion that it might be well to follow their father’s advice, but the others would not listen to him. They ate their supper, said their prayers, and lay down, but the youngest kept watch as before. Towards midnight he again heard a noise. With his drawn sword in hand, the young Prince found himself confronting another seven-headed dragon, larger and more frightful than the one he had slain the day before. The dragon straightway attacked the youth, but without effect; then the youth fell on the dragon so furiously that six of his seven heads fell. The monster begged for another blow as a coup de grâce, but the Prince declined. As on the previous occasion one of the heads rolled into a well. The youth followed it and discovered a larger palace and greater treasures. Noting the place, he returned to his brothers, lay down, and fell asleep so soundly after the fatigues of his combat that his brothers had to rouse him next morning. The youngest saw plainly that all his brothers were paralysed with fear and unable to do anything. He delivered to them the keys of both wells, telling them to take home the forty maidens and the treasure. He promised that when he had killed the dragon he would follow them. The thirty-nine sprang on their horses and rode away. Now we will return to the youngest. The conflict between the Prince and the dragon was a stern one, and they fought a long time without either overcoming the other. When the dragon realized that the struggle was in vain he said to the Prince: “If you will go to the land of Chinimatchin and bring me the Padishah’s daughter, I will spare your life.” The Prince consented to the condition, for he was too exhausted to continue the combat any longer. 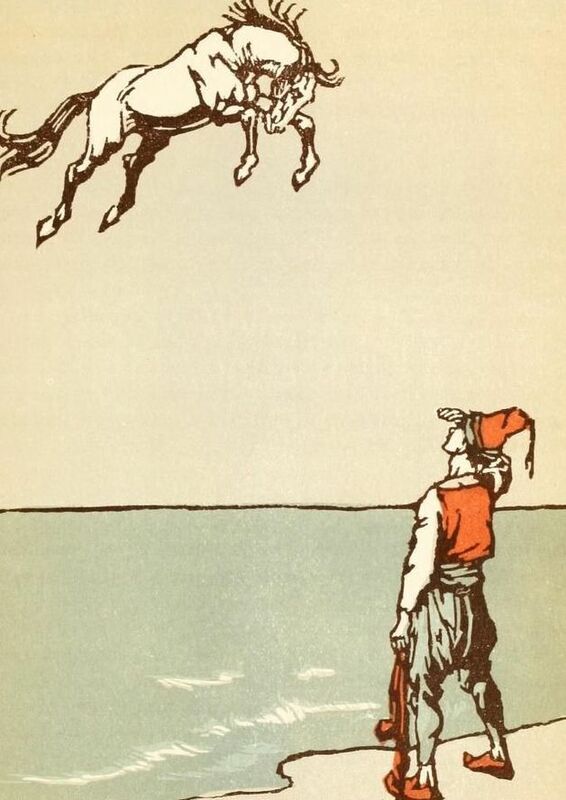 “The golden-hued steed came flying through the air.” Illustration by Willy Pogany, published in Forty-four Turkish Fairy Tales by Dr. Ignácz Kenos (193), George C. Harrap and Co. So the youth took the bridle and waited for the magic horse. The golden-hued steed came flying through the air, and no sooner was the bridle laid upon him than he said: “Command me, little Sultan! Shut your eyes–open your eyes!” and behold there was the youngest Prince in the far-off land of Chinimatchin! He alighted from the horse, took off the bridle, and walked into the city. Entering an old woman’s hut, he asked whether she could find him lodgings. “Willingly,” answered the old woman. She offered him a seat, and prepared some coffee. While he was drinking he made inquiries as to the condition of the country. The maiden had herself fallen in love with the handsome Prince, and moreover wished to escape from her constant imprisonment. Her trust in the Prince was so great that one night they left the kiosk together in secret and repaired to Champalak’s plain. On the way they discussed what the maiden might do to discover the dragon’s talisman, for through that talisman the Prince meant to destroy the monster. We may imagine Champalak’s joy when he saw the Sultan’s daughter before him. “What happiness that you have come! What happiness that you have come!” he repeated again and again, as he caressed the Princess, who was weeping all the time. Days and weeks elapsed, but the Princess never dried her tears. “If you would at least tell me what your talisman is,” she said one day to the dragon, “perhaps my days would not be quite so wearisome.” “My darling,” replied the dragon, “it is guarded in a place impossible of access. In a certain country there is a large palace and whoever gets into it never gets out again.” This was all the Prince needed to know. He took his bridle, threw it in the sea, and the golden-hued steed appeared. Accordingly the Prince fastened the magic horse to the rings, and when it neighed the gate opened. The Prince struck the gaping jaws of the lion a stout blow and split the creature asunder. This done he cut open its stomach, and took therefrom a cage containing three doves, so beautiful that their equals had never been seen before. Taking one in his hand he stroked its plumage, caressed it, and p-r-rr! it suddenly flew away. If the magic horse had not quickly flown after it, caught it, and wrung its neck, the Prince would never have met his ladylove again. Now he remounted his magic horse. “Shut your eyes–open your eyes!” and he found himself once more at Champalak’s palace. At the gate the youth killed the other two doves, and as he went in the dragon fell an inert mass to the floor. Seeing the dead doves in the Prince’s hand he implored him to let him stroke them once more before he died. The youth, seized with pity, was about to offer the birds to the dragon when the Sultan’s daughter ran in and tore them away. Upon this the dragon perished miserably. “Fortunate it was for you,” said the magic horse, “that you did not give him the birds; new life for him was in their touch.” As there was no further use for it, the bridle now disappeared, and with it the magic horse. The Prince and the Sultan’s daughter gathered together all the Dragon’s treasures and bore them to the land of Chinimatchin. The Padishah had become quite ill through worrying about the disappearance of his daughter. Search had been made for her throughout the length and breadth of his dominions, but as she could not be found the Padishah had come to the conclusion that she had fallen into the power of the dragon. When the Princess appeared again safe and sound, he gladly gave her in marriage to the Prince, and the wedding was celebrated with great rejoicings. After the honeymoon they set out, with a brilliant retinue of soldiers, for the palace of the Prince’s father. The Prince was thought to have died long ago, and his claim to be indeed the Prince would hardly have been accepted, had he not related the story of the three dragons and the forty sisters. His thirty-nine brothers married thirty-nine of the sisters, the fortieth becoming the wife of the Princess of Chinimatchin’s brother, and henceforth they all lived in the greatest happiness.